The pitching matchup the other side of the world had longed to see on Sunday never materialized, even if Masahiro Tanaka still provided Japan with a few lasting memories in his first major-league encounter with two-way sensation Shohei Ohtani. Tanaka got the best of his countryman with two strikeouts in three head-to-head plate appearances, but far more important to the Yankees than any Far East showdown were the six innings of one-run ball their Japanese import hurled during a 3-1 decision over the Angels at the Stadium. Tanaka admittedly had been more disappointed about his previous four shaky outings than he was about having a start that would’ve have represented the first mound matchup between the two compatriots pushed back a few days by Halos manager Mike Scioscia. Tanaka hadn’t been slapped with a defeat in any of those outings — largely because the high-powered Yanks had totaled 28 runs in the quartet of games — but the $155-million righty had yielded 14 earned runs and five homers over those 21.1 innings, zooming his ERA from 4.37 to 4.95. Still, he termed Sunday’s outing “definitely one of the better ones” he’s posted in May, and Aaron Boone wasn’t about to disagree. Especially after watching his starting staff — aside from ace Luis Severino, that is — mostly fail to work deep into enough games the last few turns through the rotation. And especially with rookie Domingo German slated to square off against AL ERA leader Justin Verlander on Memorial Day to open a three-game set against the Astros. 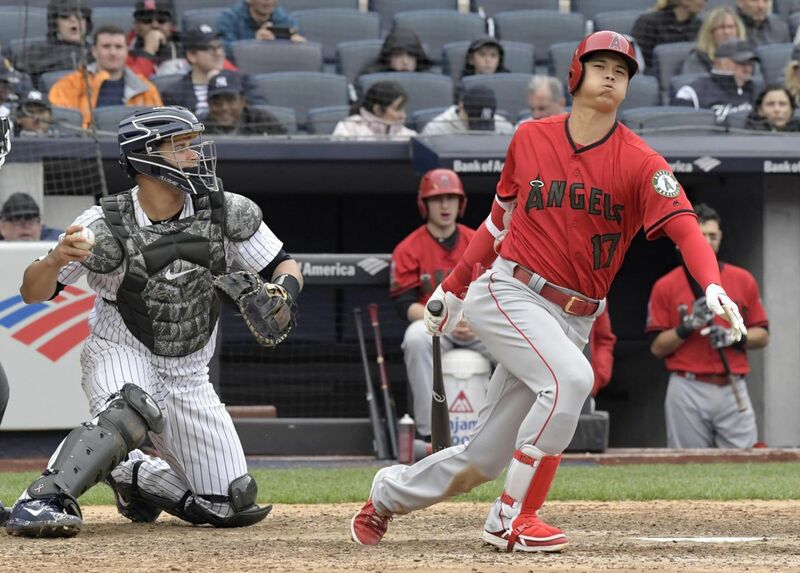 Perhaps even more significant, Tanaka and a rested pen held Angels superstar Mike Trout to four hitless trips, with Tanaka whiffing him twice after the two-time AL MVP had raked the Yanks for a homer among a career-best five hits, with four RBI, one night earlier. Tanaka properly referred to Trout as “the key batter in that lineup” and not Ohtani, whom he also fanned twice, getting the rookie slugger to wave through a full-count splitter to end the first and another 1-2 split for the second out of the sixth. After rejecting any Yankees’ interest in him as a free agent — not even granting them an audience for a pitch — Ohtani heard heavy boos from the spurned Stadium faithful all weekend. As did the superstar imported as Plan B over the winter, Giancarlo Stanton, who received the familiar Bronx cheers treatment again on Sunday after donning another Golden Sombrero to complete a horrible personal series with no hits in a dozen at-bats, including seven strikeouts. All in all, Ohtani didn’t have much impact on his first three career games in the Bronx, either, finishing the series 0-for-9 with five Ks, albeit walking four times. Counting their previous encounters in Japan — when Ohtani was only 18 in 2013, mind you — the lefty slugger is now hitless in 13 career at-bats against Tanaka. Ohtani didn’t pitch, as originally scheduled, and replacement Garrett Richards — pitching on his 30th birthday — had no idea where the ball was going all day. He walked five, drilled Greg Bird with the bases loaded to force in a run and uncorked three wild pitches as the Yanks plated all three of their runs in the third. The chilly weather belied what usually is considered the unofficial first weekend of summer, and the first three innings took about 90 minutes to complete with the wind blowing straight in from the outfield. Those gusts didn’t prevent Andrelton Simmons from taking Tanaka deep for the Angels’ lone run in the sixth, but find the video of Giancarlo Stanton going back on a ball and then staggering inward a few times before making a tumbling catch for the last out of the inning. It was Tanaka’s final batter of a performance that held more significance to the Yankees than simply how he fared against Ohtani.